How Loud Is Your Vacuum Cleaner? 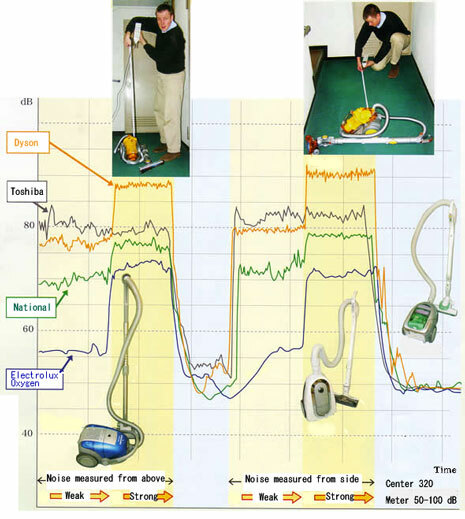 Because the popular Dyson vacuum cleaner (DC12) sounds so noisy, Japan Offspring Fund used a regular noise meter to measure the actual loudness. Sound meters measure sound in the unit decibels (dB). We compared Dyson to three other vacuum cleaners on the market. Dyson has two modes, "weak" or "strong". We found that the loudness from the "strong" mode is indeed very strong compared to other vacuum cleaners. As the chart shows, the "strong" mode of the Dyson model was the loudest, reaching above 90 dB. The Toshiba model was the noisiest of all models in when we compared the "weak" modes, and stayed around 80 dB at "weak" mode and just below 85 dB at the "strong" mode. The Dyson "strong" mode noise is also perceived by some to be rather unpleasant. Noise levels depend on the way the engine of the machines are designed. Generally, there is a fan which turns at very high speed, and the centrifugal force throws out the air, so the air is sucked in at the center and blown out at the periphery. In a cyclone type vacuum cleaner, dust is separated by the centrifugal force, so air is violently set in motion. The air flow is turbulent and of course there is loud sound and even unpleasant noise. In the case of the vacuum cleaner which does not become louder on high speed, we suppose the electric motor inside does not change speed when switched on strong. It could be the case that some additional air ducts open inside, which cause more air to be sucked in and re-emitted. It should be noted that noise is not necessarily related to efficiency. A more quiet vacuum cleaner can have better suction power, if the design is better. Electrolux Oxygen Z5954 was the most silent vacuum cleaner in our tests, both at the "weak" and "strong" modes. The noise from Oxygen vacuum cleaner never reached above 75 dB in our test. Compared to the Dyson, which reached above 90 dB, the Electrolux Oxygen is without a doubt a more silent and better designed machine. Japan Offspring Fund considers the Oxygen model to be the best vacuum cleaner on the market, and we recommend it. "This one is so quiet that it wouldn't wake up a sleeping baby", said one of our staff who happened to pass by while the tests were performed. Furthermore, none of the staff felt that the Electrolux Oxygen sound was unpleasant. Noise is an environmental nuisance. European research proposes 77 dB as a limit. The sound of your vacuum cleaner should not be unpleasantly loud, so that it disturbs neighbours or others. Our recommendation is that you try the different modes of the vacuum cleaner before you buy it.